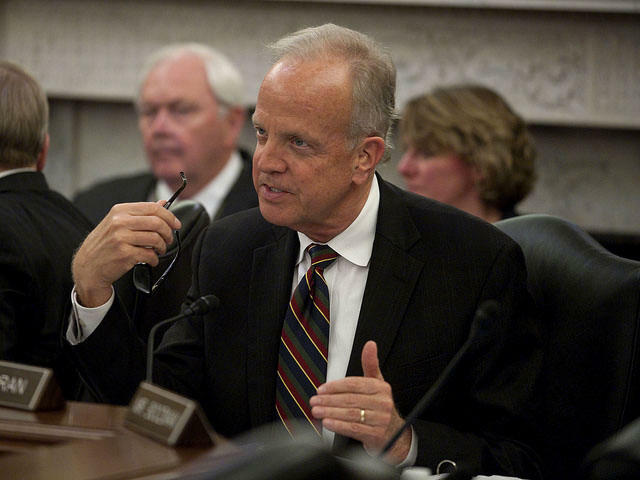 U.S. Sen. Jerry Moran speaks on the Senate floor at a hearing last May. He hosted a forum on Alzheimer's and aging at KU Monday. U.S. Sen. Jerry Moran brought the nation’s top health leader on aging to Kansas today for an overview on the latest medical research on Alzheimer’s disease. Moran and Dr. Richard Hodes, the director of the National Institute on Aging, visited Kansas City-area laboratories focused on aging research. Their stops included tours of the University of Kansas Alzheimer’s Disease Center (ADC) and the Hoglund Brain Imaging Center. The senator also hosted a forum on the state of Alzheimer’s Disease Research with KU faculty, students, researchers and Alzheimer’s advocates. He says it’s an effort to educate Kansans about the latest in science and medicine as it relates to dementia and Alzheimer’s disease, as well as "to showcase to the National Institute of Health, NIH, what tremendous research is taking place in our state to try to strengthen the opportunities that Kansas universities and others have access to those federal dollars." The NIA is part of the National Institutes of Health and is the United States’ primary agency for aging research. Congress authorized an additional $350 million for Alzheimer’s disease research in fiscal year 2016.